The scales of justice weighed in favour of an Accused woman earlier this week, when the Ontario Superior Court upheld her acquittal of impaired driving related charges in Ontario. Kimberly McLachlan was acquitted of impaired driving in August 2015 after she succeeded in having evidence inadmissible at Trial – her breathalyzer readings, to be specific. This is known as a Charter application, as it seeks to have evidence excluded based on a breach of a Charter protected right. Her application was based on the fact that when she taken to the police detachment, where she was required to provide a breathalyzer sample, the arresting officers’ had her stand on a scale so that they could have an accurate record of her weight. Unfortunately, their attempt to be thorough actually triggered a breach of Ms. McLachlan’s section 8 under the Charter – providing protection against unreasonable search and seizure. It is not part of standard procedure that the police would weigh a person who has been arrested on suspicion of impaired driving. The Judge confirmed that weighing a person is a violation similar in nature to taking bodily fluids (such as a urine or blood) without a warrant. It is nuances like this – something seemingly harmless – that will catch the attention of a skilled criminal lawyer. Circumstances like these demonstrate the necessity of hiring a criminal lawyer who is familiar with Charter protected rights. Impaired driving is a particularly complex offence, with a variety of available defences that must be reviewed in tandem with your unique circumstances. Contact our office today for a consultation that will allow us to come familiar with your situation. Dialogue surrounding mental illness echoes from the walls of nearly every courtroom across the country, which won’t come as a surprise to anyone. When dealing with an Accused person, both Crown and Defence will investigate what their client’s state of mind was like during the commission of the offence – it speaks to intent, which is a very important component in analyzing the intricacies of criminal behavior. If Crown Counsel proceeds by way of Indictment (as opposed to summarily), the Accused will have the option of having their case heard by a Judge and Jury. 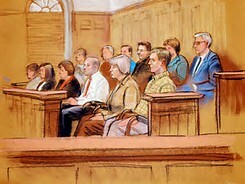 If they so choose to have a Jury, members of the public will receive a summons to attend Jury Selection. Some will be chosen, and some will be dismissed. All who are chosen to sit on the jury will not have a say in what their role will be – they are bound by civic duty to fully participate. Lengthy criminal trials are not uncommon – Robert Pickton’s Trial in 2007 lasted nearly a year, with lawyers calling 129 witnesses, and generating over 1.3 million documents. 129 individuals providing testimony, often gruesome and violent in nature, falling on the ears of 12 every day citizens, none of whom requested to put their lives on hold for a year. Jurors are required to view photo and video evidence, regardless of how brutal those images may be. But, what happens to jurors once the Trial is over? One would assume that they gladly return to the nuisances of the life they had before the Trial. Sadly, however, many never return to their normal lives. Post-Traumatic Stress Disorder is often associated with mental illness – however, this is not a fact. PTSD is a psychiatric injury. After repetitive exposure to traumatic situations, the human psyche may succumb to the disturbance. This is rarely immediate – recurring nightmares or overwhelming thoughts are normal to a point. Fresh events remain fresh in our minds. It is the fog, cotton-in-your-ears feeling, and anxiety that will indicate the onset of PTSD weeks or months after the trauma has occurred. It can be a very isolating and numbing experience – and for whatever reason, societal stigma or taboo, people tend to carry a lot of shame with their PTSD diagnosis. And it is no different for jurors like the ones who sat on Pickton’s jury. After hearing weeks of testimony, a juror can feel a genuine, bona fide connection with the victim(s). This is amplified when the victim’s family and friends are present for the Trial. Huge internal conflict can erupt when a juror must balance their responsibility and duty to the Court with their own morals and values. This internal back-and-forth is another burden, on top of what they have seen and heard, that they will be left to deal with on their own when jury duty is over. So what responsibility does our government have to jurors afflicted with PTSD as a result of their participation at Trial? It would not be absurd to consider them as victims of crime. As such, they should have access to every single resource that is made available to the victims of first instance. Last month in Ontario, the provincial government began offering free counselling for juror members, available either at the end of the coroner’s inquest, or at the end of the Trial. Only time will tell how receptive jurors are to the program, which sadly, hangs on the willingness of individuals to fight against PTSD and its crippling side effects.